At this point if you haven’t baked a cookie, you might be feeling like all hope is lost for a homemade gift. Maybe you just ran out and need a little something to give the school crossing guards, your favorite cashier at the supermarket or the UPS guy who’s been hauling your holiday goods to your doorstep the last month. 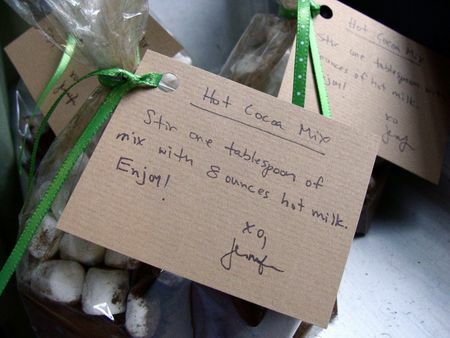 This homemade hot cocoa mix is just the answer. It’s no bake, easy to make and who doesn’t love hot chocolate? You can even make it gluten-free if you use the right cocoa—I use Guittard. 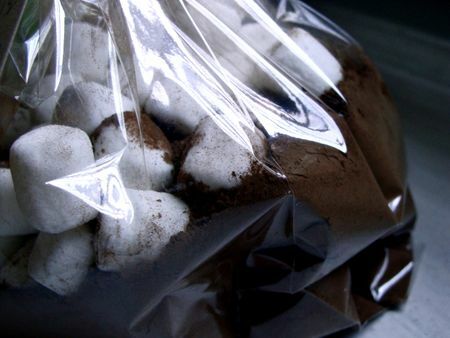 Scoop some into a cellophane bag, toss in some mini marshmallows and don’t forget to include instructions. Sometimes I also list the ingredients, though was running a little short on time myself this week. So, off I go to wrap gifts, bake some gingerbread muffins and roll out fresh pasta for Christmas Eve. I insanely volunteered to make enough for 12 people. Specifically 12 Italians. I may never want to make pasta again after this—yeah, fat chance of that happening. From my little corner here in Brooklyn, a very Merry Christmas to you all. According to the weather, we might even get some snow in time for Christmas Day! I read my vanilla powder label quite carefully and while it doesn’t say anything about being processed in a facility with wheat, it also doesn’t say it is gluten-free, so I suggest omitting it if you’d like to make this gluten-free. Same thing goes for the mini marshmallows—while most of the information I research notes that Kraft is gluten-free, you should always double check since companies change “recipes” for these products quite often. If in doubt, leave it out! p.s. I thought this was perfectly balanced and not too sweet at all, considering it’s equal parts sugar and pure cocoa. Isabella liked it, but did ask me to add more sugar next time, so also feel free to tweak for the kiddies in your life. Add ingredients to a deep bowl and whisk together until there are no lumps. 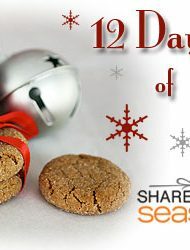 To serve, stir 1 tablespoon of hot cocoa mix with 8 ounces of hot milk. 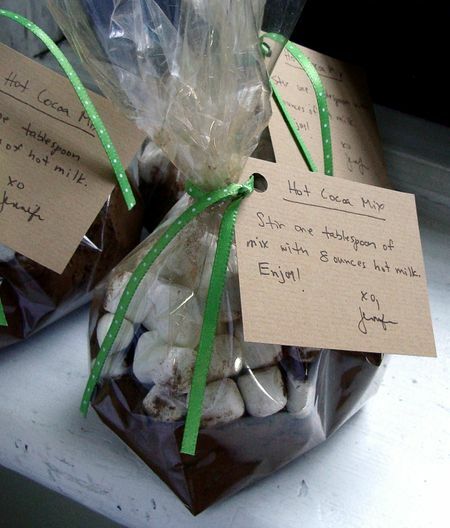 If gift packaging, spoon 4 ounces into each bag, top with a handful of mini marshmallows, tie with a ribbon and handwritten note with serving directions. A perfect gift in my book. love this idea! I keep meaning to incorporate it into my gifts each year and always seem to forget. Might have to print it off and attach it to my favorite cookie cookbooks so it doesn’t get overlooked again. Hi Jennie! 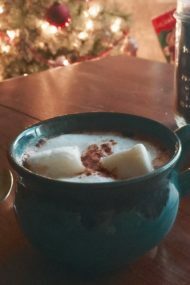 Thank you for mentioning our Madagascar Bourbon Pure Vanilla Powder in your hot cocoa recipe. Our Pure Vanilla Powder as well as all of our products are certified gluten free by the Gluten-Free Certification Organization and is noted on the label with their symbol, a GF in a circle. We take pride in producing allergen free products to meet all consumers needs. Thank you again! I love this but I am not sure what to do with the marshmallows…wisk them into the dry stuff too? What a lovely gift! Your recipients are so lucky! Happy holidays! Patty—as noted in the directions, the marshmallows are added if you’re packaging this as a gift.